He bends … for justice! Our love of bendables here is well documented. So this week, we bring you Bendapalooza — a series of EXCLUSIVE, FIRST LOOK reviews of new superhero bendables coming your way from NJ Croce. If there’s ever been a more anticipated superhero video game than Arkham Knight, I’d be hard pressed to name it. Every Batfan within sniffing distance of a console is going to be obsessed with it once it finally releases June 23. 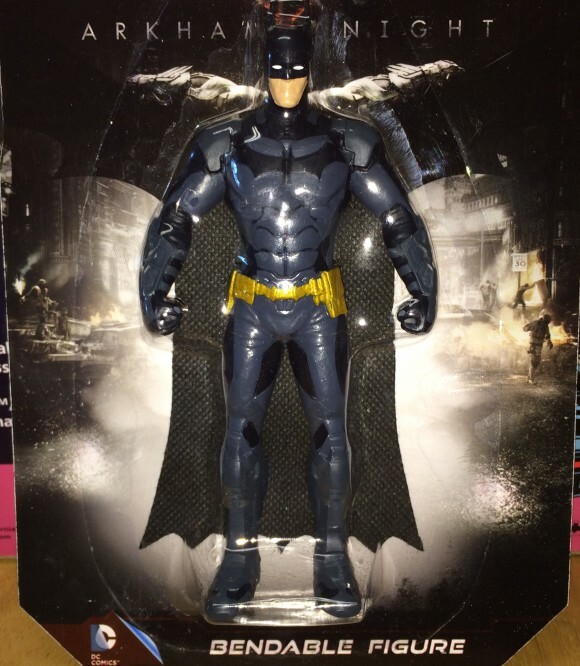 So the folks at NJ Croce were smart to make Arkham Knight Batman as part of their 2015 output. This is something you can give your kid brother or sister and not worry that the arm is gonna fall off. You can bring it into the office and sit it on top of your monitor so you can fantasize about getting home to play more Arkham Knight. You can twist it this way and that. Old and new: Arkham Bats stands guard in front of the ’66 Batmobile. I’m pleased by the heft of the NJ Croce figures. These rubber totems are solid. Arkham Batman, which stands 5 and a half inches, also has pleasing packaging. The cape is the same mesh cloth that the company uses for all its capes. If there’s a downside, it’s that there’s only the one figure (so far). I always want my heroes to have sidekicks and villains, so hopefully this figure is successful enough that they’ll add to the line. Arkham Batman is due out mid-spring. The vagaries of the West Coast port strike make it hard to pinpoint any more than, say, early May. It’ll cost about $9-$10 or so. It’s more than worth it. TOMORROW: Bendapalooza Day 2, featuring a bendable that is fleet of foot!